This is one of the five December 2014 HOS Project by Hong Kong Housing Authority. Sheung Chui Court, 376 Sha Tsui Road (map) will have three tower blocks (A has 31 storeys, B has 36 storeys, C has 40 storeys) with total of 962 dwelling units on a 1.2 Hectare with 5.5 plot ratio (800 DU/ha). 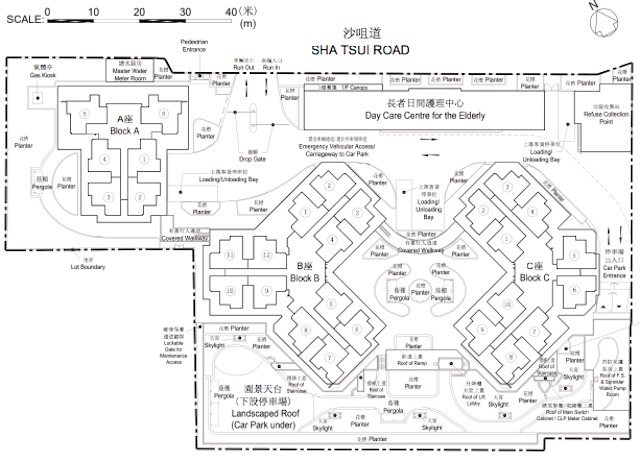 A 10,000 sqft Day Care Centre for Elderly is within the plot. Sheung Chui Court is located about 0.8 km from Tai Wo Hau MTR station. 40 minutes from Tsim Sha Tsui Station (11km away). The plot was the ex-Tai Wo Hua Factory Estate with three low-rise blocks that was demolished in 2010. The empty plot was use as a commercial carpark till 2013, that is when foundation work for Sheung Chui Court begins. Typical 440 sqft dwelling unit cost betwen HKD $2.9M (high floor) and $2.4M (low floor). Typical 510 sqft dwelling unit cost betwen HKD $3.2M (high floor) and $2.5M (low floor). Tsuen Wan Town Lot No. 514, 50 years lease commencing from 18 August 2014. Project to be complete by 2017.